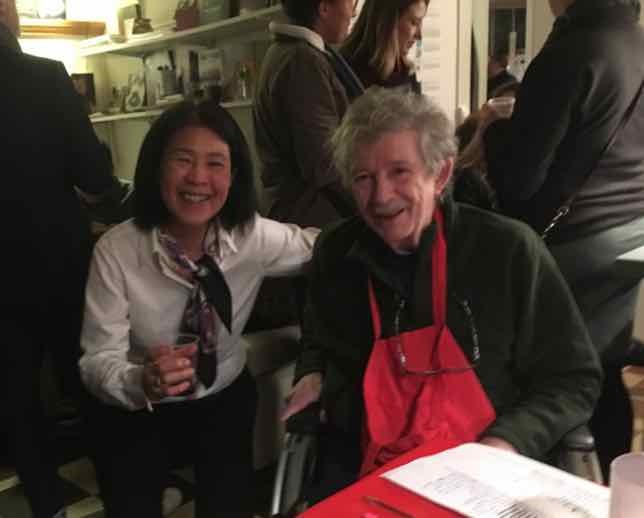 Author and pastry chef David Lebovitz has written some excellent books about French food and his experiences living in France. 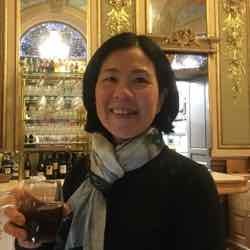 One of his posts reviewed a Parisian restaurant located near the Gare de Lyon. It’s been open since 2001 and has a loyal following. 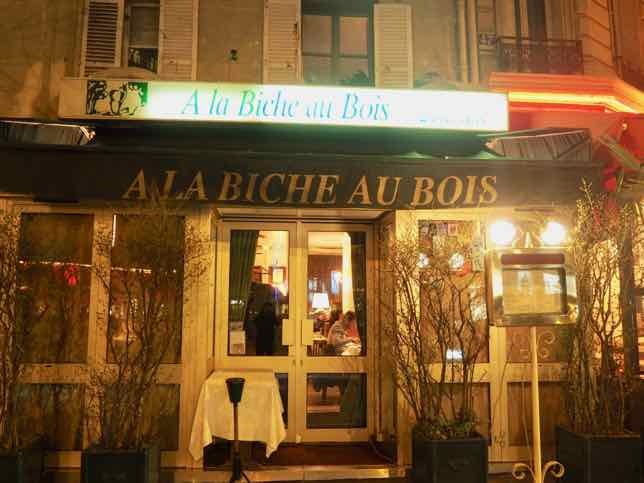 I recently had the good fortune to have dinner at this classic French bistro called “A la Biche au Bois” (Deer in the woods). Here is my review. Let’s cut to the chase. Did I like A la Biche au Bois? Yes. Will others like it? 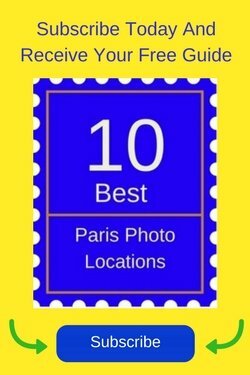 Yes, especially if they are looking for a reasonably-priced classic French bistro that serves traditional French food and are OK with lots of meat dishes….even game. The entire restaurant looked much bigger than expected thanks to the mirrors on one of the walls. It was really deceiving and now makes sense why drops-ins would rarely be able to get a table. There just isn’t room. 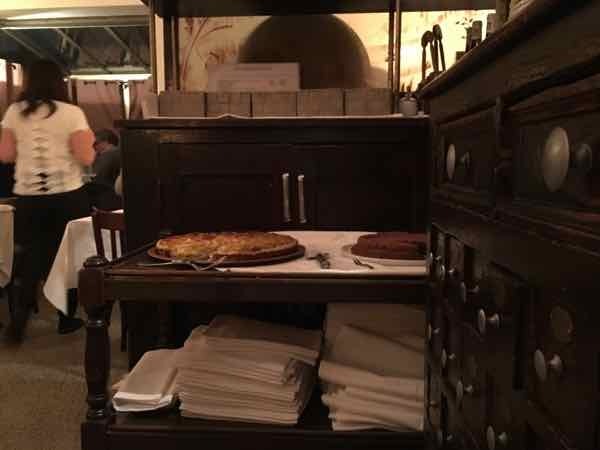 In some reviews, people have complained that it was a bit cramped and they felt they were too close to the next table. We didn’t find that. Perhaps it’s because that’s how a lot of bistros in France are. You sit close to your neighbours. What struck me right away was how friendly all the staff were, from the minute we entered. While the clientele are a mix of locals and tourists there isn’t any air of arrogance. We were warmly greeted at the door and the hostess asked if she could take our coats. The serving staff were friendly, professional and surprisingly accommodating. 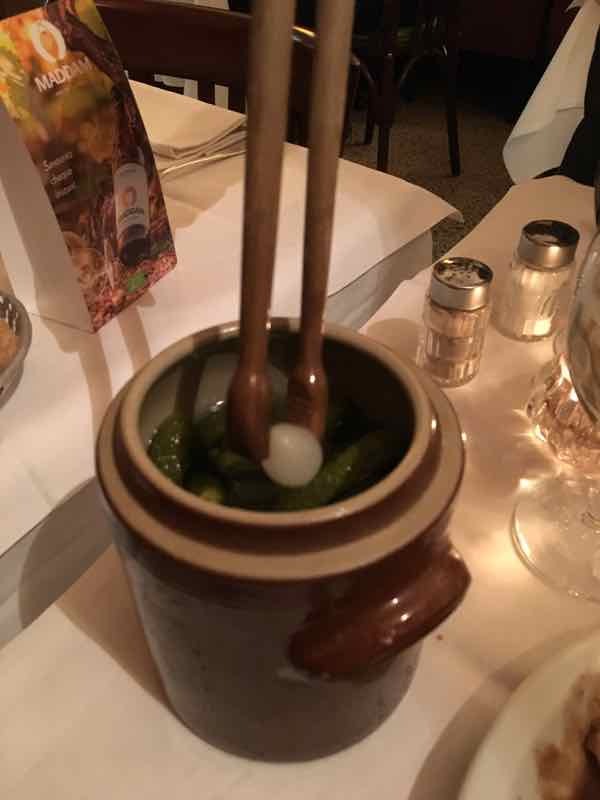 When we noticed the servers occasionally brought other tables a pot with wooden sticks sticking out, we became very curious and asked our waitress about it. She was kind enough to bring one over to have a sample….it was a bucket of gherkins! These were to accompany the rabbit paté that some guests had ordered. Wine cellar in a cupboard? Beside us was a cupboard. At first glance we just thought it was for storage. 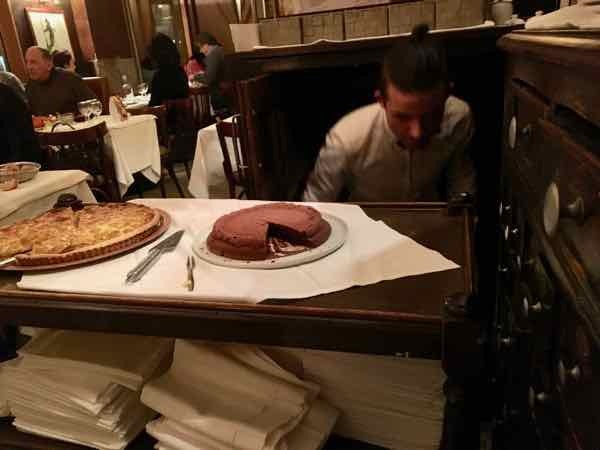 But then one of the waiters opened the door and proceeded to climb down…backwards. Turns out this little hideaway was a wine cellar! Talk about making the best use of space. 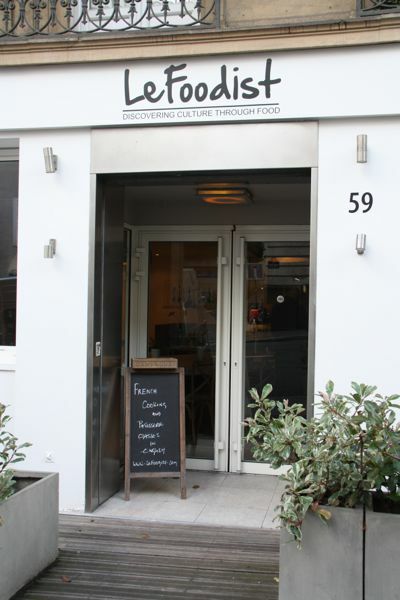 As mentioned, the name of the restaurant makes note of a deer. 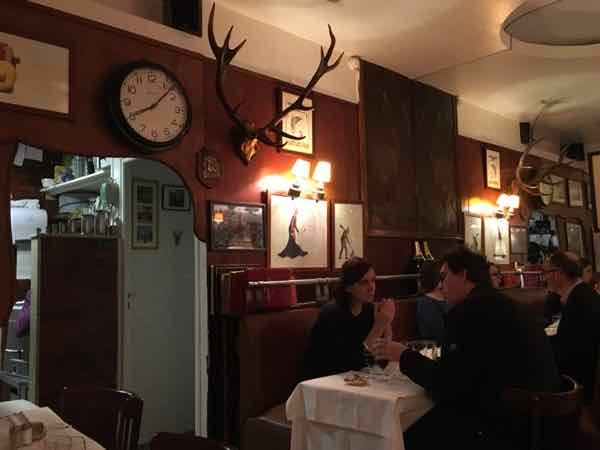 The antlers on the wall also alludes to the fact that this restaurant serves meat dishes—-traditional French cuisine (ie. steak, duck, chicken) as well as wild game (ie. venison, pheasant, and deer). There’s also foie gras and cassoulet (my favourite!). You will find salads, such as les oeufs durs mayonnaise (hard boiled eggs with mayonnaise) but not vegetarian dishes. 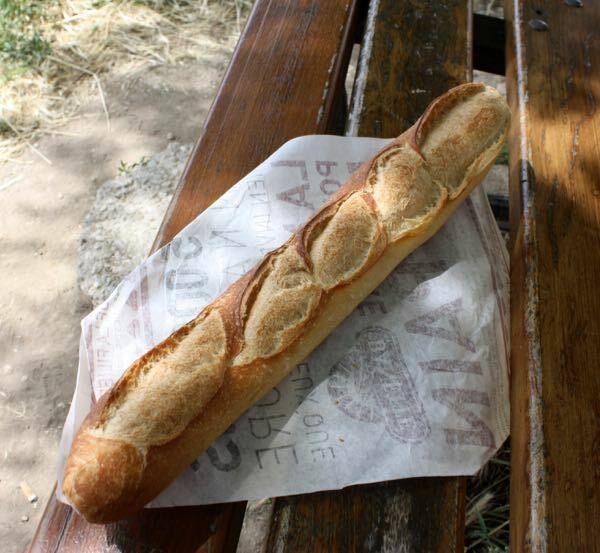 So just be prepared for lots of hearty, French food. The portions are fairly big so you won’t go hungry. My friend and I both ordered from the fixed price menu that was about 35 Euros per person. You get a starter, main course, cheese, and dessert. 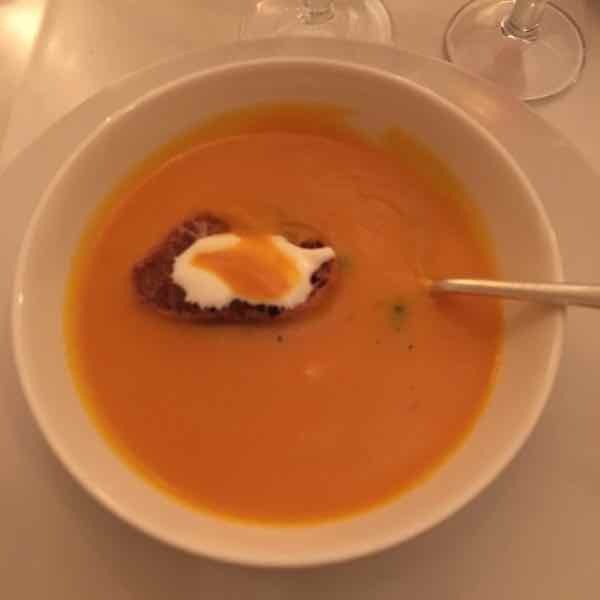 To begin, we both had the pumpkin soup that came with toasted baguette slices and sour cream but we had different main courses and desserts. 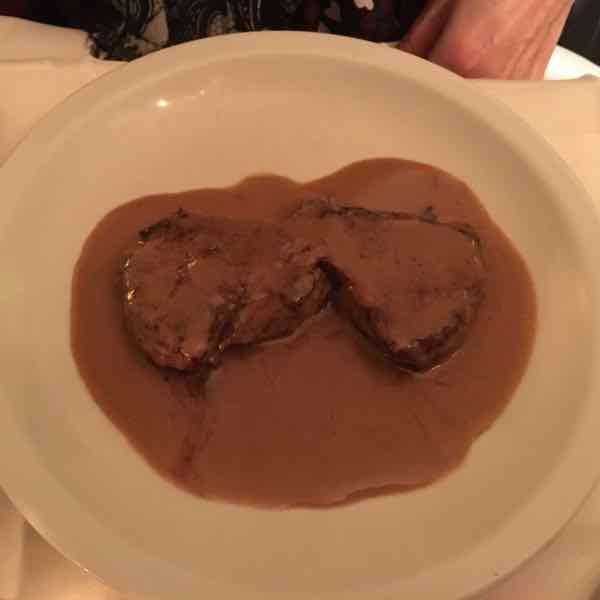 Monica had the steak with peppercorn sauce. She said the steak was cooked to perfection and was very moist. As you can see, it was swimming in a hearty gravy. 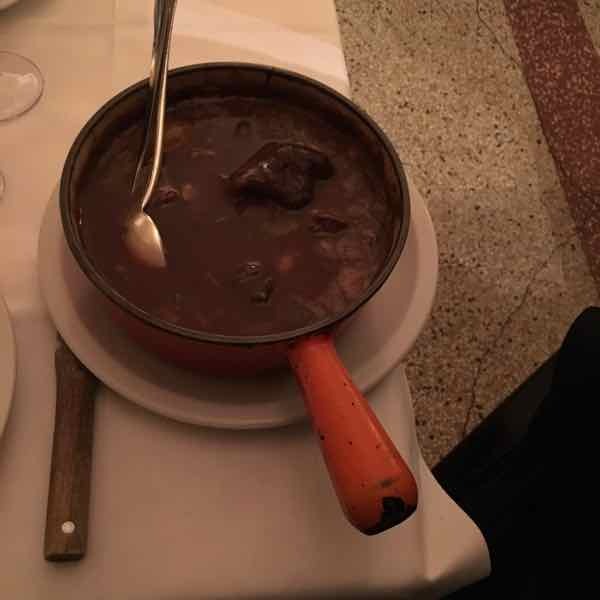 I had the Coq au Vin—-a specialty of the house. They brought me a large pot that contained a robust-flavoured dark sauce with chunks of tender chicken morsels, potatoes and mushrooms that had obviously been marinating in the red wine for ages. The chicken was so dark that at first glance, it looked like beef. Before dessert we were offered the cheese platter. It was a large tray with a wonderful assortment of goat, sheep, brie, bleu Auvergne, Cantal, and Pont l’Eveque cheeses. [Sorry, no photo. We were enjoying the cheese so much we forgot to take a photo]. We barely had room for dessert, but of course went for it. 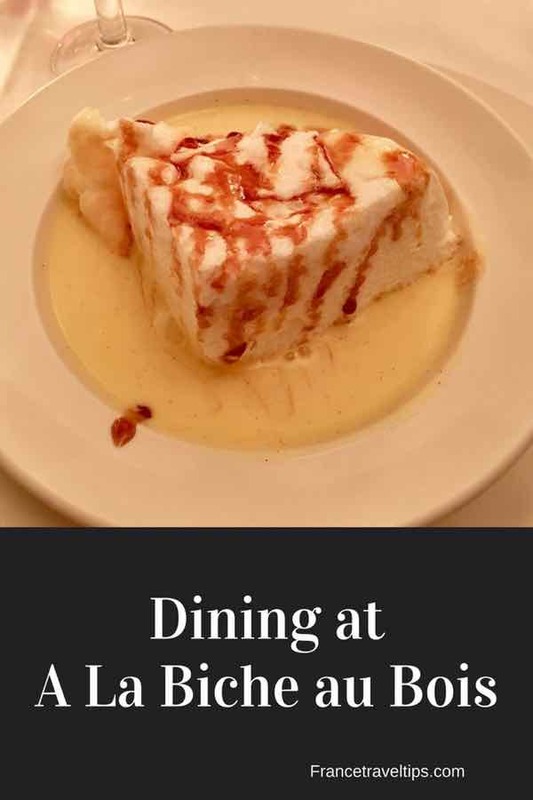 I chose the light L’Île Flottante (aka “Floating Island”), which is a poached meringue cloud served on crème anglaise (vanilla custard) and topped with a caramel drizzle. 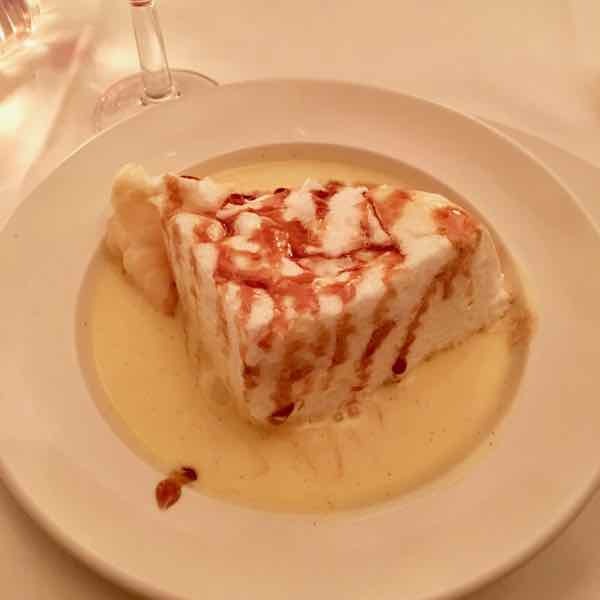 It is now my favourite French dessert—light, sweet, and delicious. 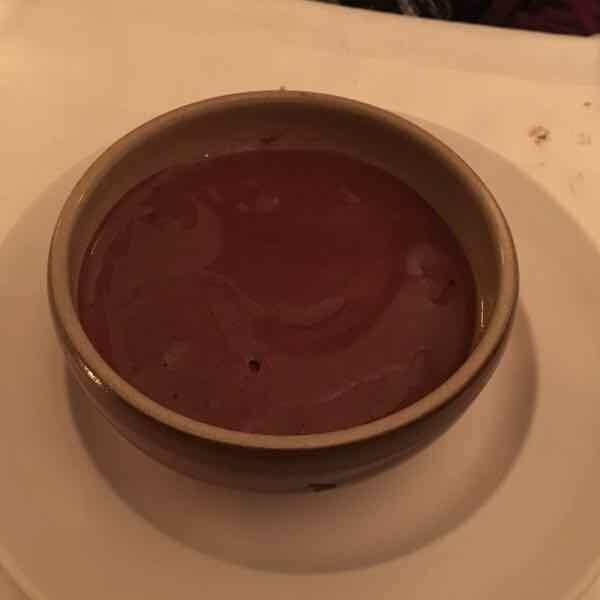 Monica had the mousse au chocolat (chocolate mousse) and said it was velvety and smooth and if you are a chocolate-lover, go for this dessert. We also ordered a bottle of the house wine that the waitress recommended and the bill came to 83 Euros (about $135 Canadian). Definitely a reasonably-priced meal for two in a classic French bistro in Paris. Good value for the money. 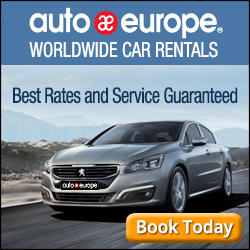 I think the only thing I’d point out is that the service was a bit too “efficient” (not fast, just not as slow as I would have liked), which is very surprising in France. Usually you have to wait ages to get the bill. The restaurant does not have a website. They do, however, have a Facebook page and supposedly one can make a reservation that way. I tried and they never got back to me. One of my friends in Paris was kind enough to telephone them and make reservations for me, so that’s how we got in. Will you need reservations? Yes. My friend and I went on a Thursday night (at 8 pm) and it was packed. There’s no way you could get in without a reservation. 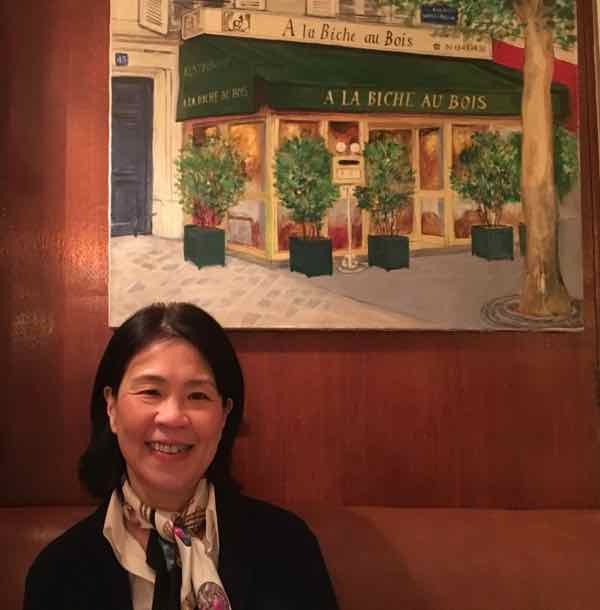 I love classic French bistros and will definitely put this on my list. Rabbit pate and coq au vin? Sign me up!